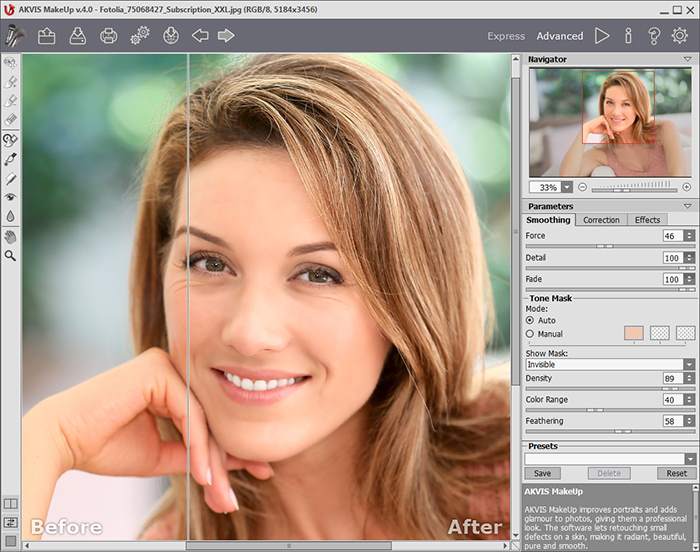 AKVIS announces the release of AKVIS MakeUp 4.0, portrait retouching software for Windows and Mac OS X, which cleans up the skin and removes blemishes, whitens teeth and fixes the red eye effect. Version 4.0 offers support for Ultra HD 4K and 5K resolution, and other important changes. AKVIS MakeUp improves your portraits giving them a professional look. The program retouches facial imperfections making your skin radiant, beautiful, pure and even. With the program you can also achieve some special effects, for example make a B&W portrait or a High Key lighting effect. The efficient post-processing tools like Spot Remover, Teeth Whitening, and Red Eye Removal help to improve the result and make the picture perfect in a quick and entertaining way. Thanks to the Batch Processing feature it's possible to apply automatic retouching to series of shots of the most important events, to process marriage, anniversary, or graduation party photos. Look your best in every photo with AKVIS MakeUp! The new version introduces stunning innovations in the interface, support for Ultra HD (high dynamic) resolution, and other improvements! Enjoy the advanced technique of visualization! Support for 4K and 5K resolution screens. The interface has been modernized and provides better display capabilities. The texts and new icons (now vector based) scale correctly even on super high resolution displays. The program offers two interface themes: Dark and Light (switch in the Preferences). Increased the Quick Preview area. New Print options. It's now possible to print high resolution images on multiple pages. Registered users of MakeUp can upgrade to version 4.0 for free. AKVIS MakeUp, Home license, sells for $39. Consult the official website akvis.com for more details about license types, versions, and prices of the software. AKVIS (http://akvis.com) specializes in development of image processing software. 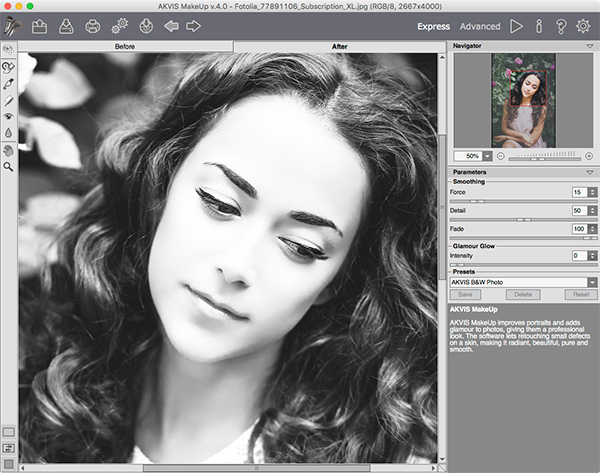 Since the company's launch in 2004, it has released a number of successful products: standalone applications and Photoshop plugins for Windows and Mac.